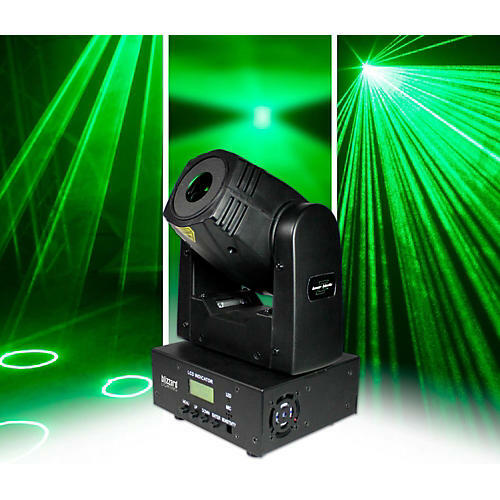 Moving head fixture with a powerful, wide-beam laser. The Laser Blade G is a powerful, compact moving head fixture with lightning fast 540° pan and 270° tilt for spectacular visual effects. It’s equipped with a 50mW, Class 3R wide-beam laser with 15KPPS galvo scanners for smooth shapes, animations, and more for jaw dropping effects. This ultra-bright, dynamic fixture is packed with a ton of goodies like 133 geometric figures, 14 animations, 76 types of beam patterns, and even 2-in-1 frame projection in DMX mode where any two separate shapes or patterns can be individually positioned, rotated, zoomed, and more. It can be operated in standalone mode, auto-beam, auto-animation, sound active mode, or via DMX where you take full control of pan/tilt, zoom in/out, rotating, drawing, billowing, speed, and animation selection. Want to really throw things over the edge at your next show? Set up two or more Laser Blade G fixtures in master slave mode with reversed pan and tilt, add some fog, and get ready to witness some serious mirrored fat beam liquid sky effects. This fixture also features a super easy-to-use 4-button LCD control panel, IEC power input connection, 3-pin DMX in/out connections, mounting bracket, and weighs in at less than 7 lb. Take your lighting show to the next level with this dynamic fixure—order yours today.